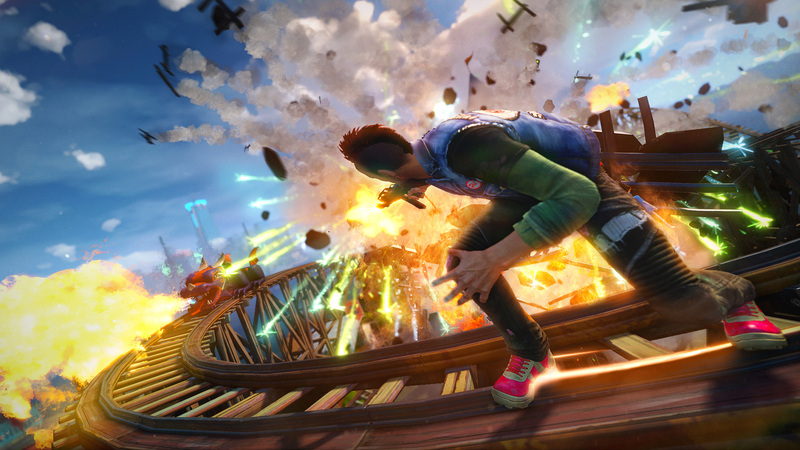 Sunset Overdrive kicks off an important winter for Microsoft. Along with the incoming Master Chief Collection, the hope is that these AAA exclusives can sell Xbox One consoles. Whilst I’m not convinced that Sunset Overdrive can do this on its own, it certainly puts an overcharged foot in the door and will convince the neutrals to at least take notice of Microsoft’s black box. Set in 2027, Sunset Overdrive’s open-world campaign revolves around the introduction of an energy drink, called Overcharge Delirium XT, to the city of Sunset City. Of course, the drink turns out to be contaminated and turns all drinkers into mutants. Players are tasked with eliminating these mutants through various missions scattered around the city. 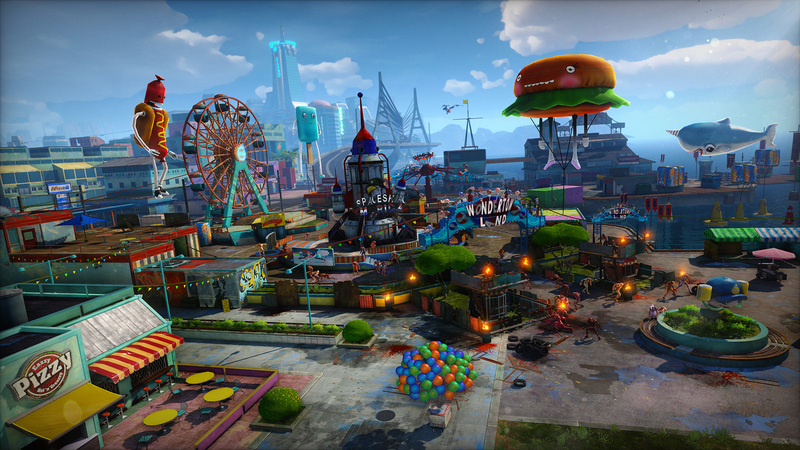 Sunset Overdrive slowly introduces the player to the various moves, weapons, traps and overdrives at their disposal. You can quickly feel overwhelmed with what is going on, and quite frankly I found that the best way to learn how to use this stuff was to simply get out there and start killing things. Movement around the world consists mainly of jumping and grinding, and you’re actually encouraged to kill enemies this way also as you’ll earn bonus points and upgrades for doing so. The campaign missions are genuinely interesting to follow and, arguably as it should be, is the biggest strength for Sunset overdrive. The overall humor in the game is also spot-on, with quips and one-liners constantly entertaining your ears. When playing through the campaign missions, you can often lose yourself in the world around you, which is no bad thing. It can become a little disjointed when you’re suddenly reminded that this is an open-world and you have to then make your way to the next mission. Perhaps I’m just a little burned-out by the open-world genre, but with a campaign as good as this one, I’d rather just play through the missions in sequence. Combat can feel very chaotic at times as you frantically mash buttons to take out the hundreds of enemies that swarm around you. Whilst ammo is often in good supply, you never feel like the guns you carry have quite enough shells in their clips, so you’re frantically having to change weapons mid-fight which is far from ideal. Nevertheless, enemies multiply with no visible performance drops and you can’t deny that the game is fun to play. The biggest disappointment during the time I spent in Sunset City was ultimately the thing that excited me the most about the game before I played it; the co-operative multiplayer. Dubbed “Chaos Squad”, players must work together to clear a number of missions consecutively where points are awarded for successful completion. It works well enough, if a little disjointed (you have to run in the open-world to the next mission start point, where a loading screen then greets you prior to the mission actually starting) but it all feels like a tacked on experience, rather than something that was integrated fully from the start. Whilst not the system seller that Microsoft had hoped for, Sunset Overdrive is a solid game that does a lot of things well. It comes at a time where the open-world genre has been around the block a few times which can detract from the experience slightly, but taking the campaign aside and treating it as the main focus in the game, it’s an experience that you’ll enjoy from the first mission to the last.